Home / Technical / What Visitors See When Your Video Is Still Being Processed At YouTube? YouTube is definitely the biggest video repository, we can say. Millions of videos are uploaded on YouTube regularly. Have you ever been curious to know, what visitors will see when your video is still uploading, or just uploaded from your end, but still processing at YouTube servers? But what it is processing? Actually when you upload the video it may be in AVI, MPEG or other format. 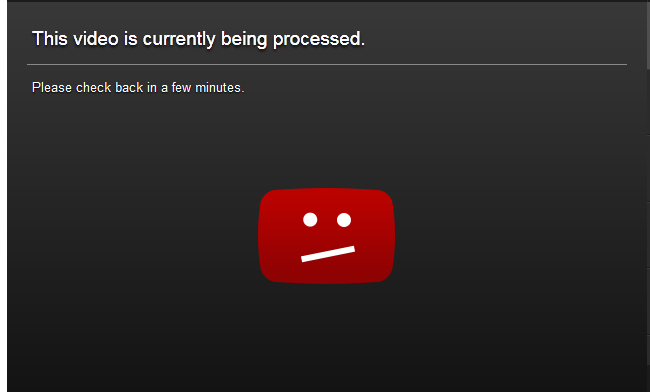 Now YouTube needs to process your video to convert it into FLV format so it can be played with the Flash Video Player. Based on the format of the video the visitor have to be presented with different embedded video player, which can support playing the specific video. Why so many filetypes and players? Usually video files are having two different areas; the Video and the Audio. The program segments which can process those areas (to save, and later, to play) are known as CODECs. So based on the file type (eg. WMV, MOV) there are different Video CODECs and Audio CODECs used to store the file in the digital format. Now to play that file again, it has to be converted into Analog format the same CODECs needs to be used, and hence, has to be available on the device where the file is to be played. The other important thing which play vital role in a video file is the Frame Rate. In simple words, it is the # of frames passed in front of your eyes in a second. The more the frame rate is, the smoother the video is; but it grows larger, as now it has to store more frames per second of video. Of course the resolution of the video frame and its size (on screen) affects, the video file size too. Now as we know we need a player which can have the CODECs to play the video file, which are used to save it (i.e. according to the file type). It leads us to have different video formats (including some proprietary formats) and their players. As the reach of Internet got wider, the website which were having embedded videos, have to be careful to serve various kind of video files and loading the video player supporting the file format. There, came the idea to have a kind of standard format to be used for all videos, so they are available to the audience around the globe in the standard and same format. It was the time when Flash Players got popular and were supported by almost all browser. There came the idea of Flash Video files and Flash Video player. Well, pretty simple (technically not so). When you upload your video, it is converted to FLV (Flash Video) – at the frame rate the converter is specified with. So now no matter what your source video type / audio type /frame rate/ resolution was; it is now available in the FLV format. So it can be played in any system/browser which is armed with Flash Player. BTW: Are you curious to know which tools/softwares can be used for this video conversion process? FFMPEG: http://www.ffmpeg.org/ – is one of the best such tool which is available for Free, and it is Open Source product.